If you’re looking for high-quality water jetting services in your local area, then get in touch with Septic Zone. We all know how difficult it is to deal with tough clogs and when you have a clogged drain or sink it can be a complete nightmare. These type of clogs can be the start of something of a more deeply rooted problem. When you experience drains and sinks that are very slow draining, or you have multiple blockages at one time, it is likely that you need the services of a trained and certified professional water jetting company. When you have multiple lines but are all clogged up at the same time, or you find your lines continuously getting clogged, it is more than likely that you have backup problems in your whole sewerage system. The best way to fix this kind of problem is with a high-pressure water jet. The problem is you need a competent contractor that knows how to properly use the equipment to rectify your problem. If you leave a slow draining sink or toilet to its own devices, and you do not get it properly sorted out, you will find that it creates problems with your entire plumbing system. You will often find that you will have water appearing in sinks, bath’s and sometimes even in the garden. 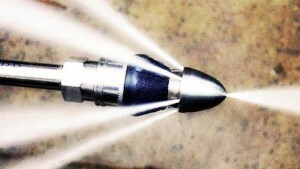 To alleviate the problem in a nondestructive manner, your best course of action is hydro jetting. Hydro jetting is the process that uses high-pressure water to get rid of any material that is blocking the pipeline. It is a highly specialized methodology that uses pressurized water to help push the blocking debris out of the pipe. The pressure of the water often reaches 3000 PSI and this will move most blockages. The trained professionals at Septic Zone use the latest techniques to make sure your plumbing becomes fully functional and safe again. It is a safe method that causes no problems to your home, children or pets as the only material used is water. Because Hydro jetting also cleans out the inside of your pipes, it means that future clogging has less chance of happening as there is no debris left on the inside of the pipe. This means you save yourself lots of money and frustration in the future. At Septic Zone, all our work is fully guaranteed. If you want to decide whether Hydro jetting is right for you and your property, call Septic Zone today for a free estimate. Check out our other services page.